Our final ‘perspective’ comes from Jim Memory who is co-editor of Vista, and course leader for Redcliffe’s MA in European Mission and Intercultural Christianity. Spain has always had a rather love/hate relationship with the rest of Europe. Throughout its history Spain has allied with the Dutch, English and Germans against the French, with the French against the English, and found itself alone facing Germany, France and England. This could be said of many other countries but no Western European state, not even the United Kingdom, has been as staunchly isolationist as Spain. Spain’s national identity, forged under the Catholic Kings of Ferdinand and Isabella in 1492 when Jews, Muslims and later Protestants were expelled or converted has, for the best part of five centuries, been that of a bastion of Roman Catholicism. This religious isolationism has played out politically and economically too, most recently, during the dictatorship of Francisco Franco (1939-1975). Whilst initially favourable to the axis powers, Spain under Franco remained largely neutral during the Second World War, afterwards adopting a stict policy of autarky (self-sufficiency) and cutting off almost all international trade for the best part of twenty years. As a result Spain was the only major western European nation to be excluded from the Marshall Plan. Spain’s isolationism had already started to crumble long before the death of Franco in 1975 but it wasn’t until 1982 that Spain joined NATO and 1986 that Spain joined the EEC, the forerunner to the European Union. Over the last thirty years Spain has been transformed into a modern liberal democracy and has reaped significant economic benefits. Tourism, construction and free-trade revitalized the economy and, since joining the EU, Spain has received more EU structural funds than any other member country. Membership of the Euro further fuelled the construction boom propelling Spanish earnings and GDP towards the European mean. As a result, for more than a generation, Spaniards have been reflexively pro-European, apparently convinced of the truth of the dictum of José Ortega y Gasset, the philosopher and writer, that if “Spain is the problem, Europe the solution”. That is no longer the case. In five short years, the Spanish economic, political and social bubble has definitively burst. The economic recession has left over six million Spaniards without work (27% of the working population) but it is among the young that the impact has been most dramatic. 57% of the under-25s are without work and facing emigration as the only alternative. And the austerity measures that have been required by the EU in order to support the Spanish economy have meant drastic cutbacks in public spending, turning Angela Merkel into a hate figure. 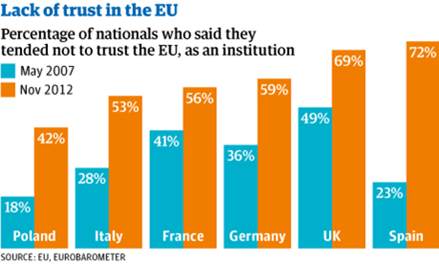 The degree to which Spanish trust in “Europe” has collapsed is well illustrated by the findings of a recent Eurobarometer study (Figure 1). As recently as 2007, the Spanish were one of the most pro-EU of the Europe’s larger countries. Less than five years later, Spaniards are found to be even more Eurosceptic than the British. Spanish isolationism meant migration to Spain was rare until very recently. During the early 20th Century many Spaniards emigrated from Spain to Latin America and during the 60s and 70s to Germany, France and beyond, but migration to Spain was limited to wealthy Northern Europeans seeking a place to retire on the Costas. All this changed from the mid 90s. 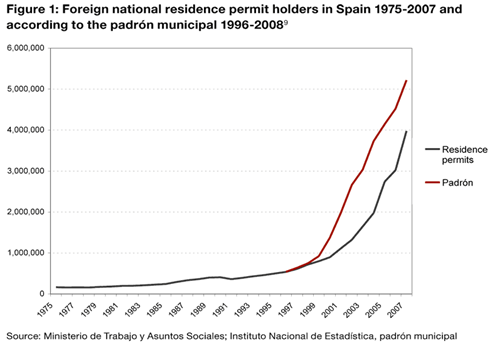 From under half-a-million foreign residents as recently as 1995, the boom in the Spanish economy and liberal migration policy saw that figure rise to nearly six million or 12% of the population by 2009 (Figure 2). The influx was brought to a shuddering halt by the economic downturn and today many young Spaniards are emigrating once again. Spain’s population shrank by 200,000 during 2012. Whilst they are outraged that austerity measures imposed (as they see it) from Germany, the young seem reconciled to learning German to find work there. In Madrid and Barcelona there has been a 60% jump in the number of young Spaniards seeking to learn German (The Economist, June 1st 2013). Even so, the last 15 years of migration to Spain have changed the country forever. After 500 years of isolationism, today one-in-eight citizens is a migrant. The Spanish church of the future will be an international church. The isolation of the past is a distant memory. A truly contextualized gospel for Spain will not only take into account Spanish history and culture, but also the impact of migration over the past 15 years. Previous generations faced with economic or political crises have turned to the Roman Catholic church for leadership, but the Spanish church is aligned with the governing right-leaning Partido Popular. Unlike Ireland or the US, the Spanish RC church has not (yet) suffered from scandals of sexual abuse however it is under attack for the generous tax arrangements it enjoys. Most Spaniards, when asked about their religious affiliation, continue to identify with the RC church but have disassociated themselves from the church´s positions on human sexuality and reproduction. Because of its low fertility rate in recent decades, Spain is ageing rapidly. Having had 5.6 people of working age for every retired person in 1970, Spain has just 3.6 today. By 2050, the ratio will have deteriorated to 1.5, according to the OECD. Religious isolationism is also a problem for the protestant and evangelical churches in Spain. Persecution during the time of Franco was followed by many decades when evangelical churches isolated themselves from the public sphere, except where public problems such as drug addiction and, more recently, migration came to them. The economic crisis has changed this however. Not all evangelical churches wanted or felt capable of dealing with people with drug problems but opening a food bank has become more and more common. The vast majority of evangelical churches in Spain now have an official or unofficial distribution of food to the needy. Whereas in the early 2000s food hand-outs were generally to poor migrants, today many Spanish families are turning to the church for help, whether that is the food banks of the evangelical church or those of Caritas, the RC charity. The arrival of migrants has also had a marked impact on Spanish churches, particularly the arrival of significant numbers of Latinamerican and Romanian evangelicals. Some churches have become predominantly churches of migrants with just a small minority of nationals. Many more ethnic churches have appeared, Romanian churches but also new Spanish-speaking churches gathering believers from single nations despite their common language. Integration is an on-going challenge. Faced with an aging population, failing trust in political and religious institutions, and economic stagnation, where can Spanish citizens turn for hope? The challenge for Spanish churches is to remain confident in the message of hope that is found in the gospel, to be what they were called to be, a people “from every tribe and tongue and people and nation” (Rev.5:9) will gather to worship and serve him. As Tomas Sedlacek argues this world´s only hope is in a return to the consumption-driven economic growth that got us into this mess. The churches of Spain, and across Europe must incarnate and communicate a different hope, one that solves the isolationism that beleaguers the soul of us all: our isolation from God and from each other. Europe is not the solution for the problem of Spain. The only hope for Spain; the only hope for Europe was, and is, and always shall be Jesus Christ. There are two main observations that come to mind as Albania, an eastern European country thinks about the EU. The secular observation focuses on the hopeful economic development that EU countries could extend over to our country. Yet the Christian perspective—a sad one, is that of a shrinking church especially in some of the major EU countries. The latter is also observed in a correlation with the moral decay and deterioration which runs as deep as the most basic cell of society—the family. The Biblical values that once shaped the European society are rapidly declining and being despised. A spiritual hunch buzzes that this will eventually, if not already, have implications in the economy, politics, the media and beyond. Europe is coming to a tipping point, together with some other greater world economic powers. Are we losing a generation? We should ask the right questions, while visiting churches at some of the once great Christian nations of Europe; countries from which revivals sprang out to the ends of the earth. Why are most churches shrinking? Why is the majority of the membership at an older age? Why are some of the church facilities being sold to bars, social clubs, or worse? Why are there fewer and fewer European missionaries? We are losing a generation. We are not discipling our children. Yes, the European church has values but it is failing to pass them on to the next generation. Yet children and youth are a third of the European population; a great potential; our present future, and within such an easy reach in the Christian family context. Sadly many Christian families are surrendering this sanctified responsibility to the local church. On the other hand many local churches are stressed out more with corporate events and are failing to disciple. Who is then discipling our children? 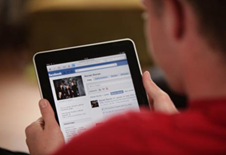 Statistics say that most of the youth and children have access and are active receptors of internet media, committing a great deal of the potential character-shaping time to it, on devices bought by their own parents. By doing so, parents are avoiding their responsibility in spending time discipling their own children. Taking them to church for one hour a week will not outweigh the time that this world’s media disciples the next generation in our very own home. There is some excitement that due to the economic migration, many other Christians are moving to Europe as well. The reality is that some of the larger churches in Europe now are the African, Latin American, Korean, Romanian or Chinese churches. Yes, in that aspect Christianity is being sustained in Europe. Yes, they have a lot to offer, but until now they have been strikingly nationally centered. Whilst it is legitimate to hope that these churches will eventually evangelize some of the unreached European nationals, on the other hand the European church should not expect that missionaries will also disciple the next generation of the existing European Christians. That task belongs first to the Christian families within their churches. This false expectation I think is another blind spot of the European church. If we asked Jesus (and we still can) what is His vision and mission for the church he would again tell us to go and make disciples from our context all the way to the ends of the earth. Could it be that “the ends of the earth” is not just limited to a geographical expression but encompasses time as well? When did this mission and vision for His church end? If not, why are we struggling to find a vision? We have blind spots because at the present we are small and incapable to see the big picture. A greater risk in addition to the problem of having a unified vision, and blind spots, is the risk of being blindfolded. The European church is not lacking a vision—in general we are just looking in other directions, or not looking at all. I rejoice in the fact that Proverbs 29:18a, “Where there is no vision the people perish…”, has been a theme in the past articles. Interesting enough, the whole book of Proverbs is expressed in the context of a father passing wisdom for everlasting life to his own son—the old generation to the new. The passage itself is sandwiched in the context of verse 29:17 “Correct your son, and he shall give you rest; yes, he shall give delight into your soul” and verse 29:18 continues: “but he that keeps the law, happy is he”. Even though our hearts are troubled for Old Europe, yet there are promises in God’s word. If we keep his commands, our Father will fulfill our hearts’ prayer. It will take a miracle of numerous miracles to transform Europe, so let us actively believe in God and see the fulfillment of the vision that Jesus has for his church, even in Europe. It already happened once, when one man, Jesus, discipled just twelve. The rest is the history that the Church of God in Europe should redeem. Church Planter, VP of the Albanian Evangelical Alliance and founder of the International School of Theology and Leadership, Tirana. The last issue of Vista (Vista 13, April 2013) contained naturally, a number of emphases on the economic and political crisis in the Eurozone, the secularism of the continent, and a lament that the continent that was once a missionary powerhouse was arguably in terminal decline. But the hope for Europe expressed by those who are viewing it from outside seemed to me to be too dependent on the challenges of sending missionaries. I have long argued that the Euro-centric missionary enterprise that made such progress in the 19th and 20th centuries is not easily reversible. Missionaries then had skills in education, medicine and the sciences that meant they had something that recipient cultures wanted and needed. There were power dynamics at play also insofar as those who came were extensions of Empire. These dynamic aren’t present in Europe today. This is not to say that Europe doesn’t need missionaries. But their energy and commitment will not be enough. Even the vibrant Christian commitment of first-generation economic migrants in Europe is no guarantee that the same secular environment won’t dull subsequent generations. But I can see a new dynamic emerging. The evangelicalism that inspired so much missionary endeavour is changing. And it needs to change. Too often evangelicalism has been experienced as a boundary-setting, rule-imposing culture. And people in Europe have said ‘no, thank you’, not to Jesus necessarily, but to the way the church has packaged a relationship with Jesus. 21st century western culture, of which Europe is an example par excellence, isn’t just one more chapter in the history of the world. It is the first truly globalising culture. The ubiquity of television and social networks, the ease of travel, the suspicion of institutional authority – these things are spreading far beyond Europe’s boundaries. The challenge to reconvert Europe might be better recast as the challenge to reimagine how the Gospel can engage with a culture whose influence is growing. And that, primarily, is a task for the church in Europe. Over the next few days we will be posting four perspectives on Europe, in response to the ‘outside’ view given in Vista 13. Europe suffers from amnesia. She has forgotten the source of her identity and of the values that shaped her culture. She has lost sight of the underlying unity expressed in the word “European” and which enabled the unique project we call the European Union to happen in Europe and not in Asia or in Africa. Europe, however, is not simply something ‘out there’: we are Europe. We are the Europeans. We are suffering from amnesia. We are living today under what Charles Taylor calls ‘exclusive humanism’, which insists in the name of civility, human rights, democracy and tolerance, that transcendent religion and moral values be banned from the public square. Education, under the influence of this ‘exclusive humanism’, has become a tool for raising young Europeans with a deep scepticism about the role of religion, Christianity and the church in Europe yesterday, today and certainly tomorrow. Against this background then, let me make three preposterous propositions. Ruins of Lindisfarne Priory on Holy Island built on the ruins of earlier monastery established by St Aidan in 635AD and one of the hubs of Celtic mission in Europe. One, the story of Jesus has been the single greatest factor in shaping Europe’s past. This is not usually what we learn at school, of course. But let’s ask what made Europe ‘Europe’. This western peninsula of the Eurasian landmass was populated by pagan peoples from the east. We still speak Indo-European languages, a fact which reminds us of these roots. So why not call ourselves western Eurasians? What happened that gave Europe it’s own distinct identity from Asia? Paul, Patrick, Boniface and many other messengers came to the peoples of Europe telling the story of Jesus. They introduced the God of the Bible to Greeks and Romans, Gauls and Celts, Scots and Anglo-Saxons, Friesians and Franken, Suevi and Slavs, Goths and Vandals, Rus and Balts, and eventually the Vikings. They were all exposed to a common story, summarised in the Apostles’ Creed. Kings were tamed, enemies were reconciled, communities were transformed. A common foundation for the European way of life was laid, albeit with regional distinctions. After the Reformation, the rise of the nation state obscured the Christian unity of European identity. As historian Christopher Dawson says, modern nationalism has led every European people to insist on what distinguished it from the rest, instead of what united it with them. While Europe is essentially a community of peoples originally rooted and nurtured in Christian beliefs and values, few modern Europeans see this big picture. We can’t see the wood for the trees. Two, the Bible has been the single greatest source of inspiration for Europe’s culture and society, including her values. Many monasteries had scriptoria where Bible manuscripts were painstakingly copied for use in prayer and study. Until recent centuries, the Bible was by far the primary inspiration of Europe’s art and music, literature and language, law and politics, healthcare and hospitality, ethics and education, even gardening and agriculture! Concepts we take for granted, embedded in western thought for centuries, had their origin in the Bible; such as the dignity of human life, rooted in man being viewed as created in the image of God; or linear time in terms of past, present and future, unknown to cultures outside of Biblical influence. Even science emerged from the monasteries: the father of experimental science, Roger Bacon, was a 13th century Franciscan friar. If the Bible has had so much influence on the shaping of the European mind, why is it ignored in our education today? Arch-atheist Richard Dawkins admits we cannot understand European history without understanding Christianity and the Bible. Three, minorities faithful to Jesus’ teachings have played a totally disproportionate role in Europe’s welfare. Despite many dark chapters of church history, when believers were faithful to Christ’s character, movements began that liberated slaves, emancipated women, alleviated suffering, championed justice, cared for the sick and sheltered refugees. Creative Christian minorities in modern times initiated the Red Cross, the SPCA, Alcoholics Anonymous, Amnesty International, cooperative banks and countless NGO’s. Even the story of the European Union begins with devout believers like Robert Schuman and Konrad Adenauer who set out to obey Christ’s command to love one’s neighbour in international politics, believing that Europe’s only hope was to be rebuilt on Christian foundations. Which all lead to a fourth proposition: post-christian Europeans today are squatters, living in a house without paying the rent. 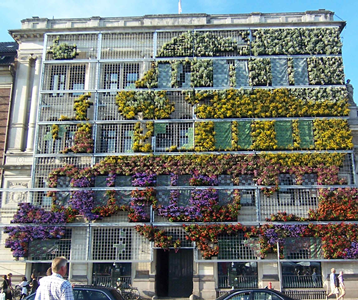 Our European society is a house built on a Christian legacy of values and concepts with a post-modern concoction of superstructures. Yet generally we give little credit to these foundations. The refusal to mention God in the proposed EU constitution is one example. In short, we’ve become squatters. European values include brotherhood, equality, solidarity, freedom and peace. Yet can we have brotherhood without fatherhood? or equality resulting from a process in which only the fittest survive? or solidarity when we believe we are nothing but ‘slime plus time’? Our task as the church includes jogging Europe’s memory of how the story of Jesus and the Bible itself have so profoundly shaped our culture. We need roots that will produce sustainable fruit and a sustainable future. But we don’t choose or invent roots. We discover them… by digging deeply.